Every doll needs a versatile bag to carry all her ‘stuff’ in so I’m really excited to be making this cute little doll size beach bag doll clothes pattern available. 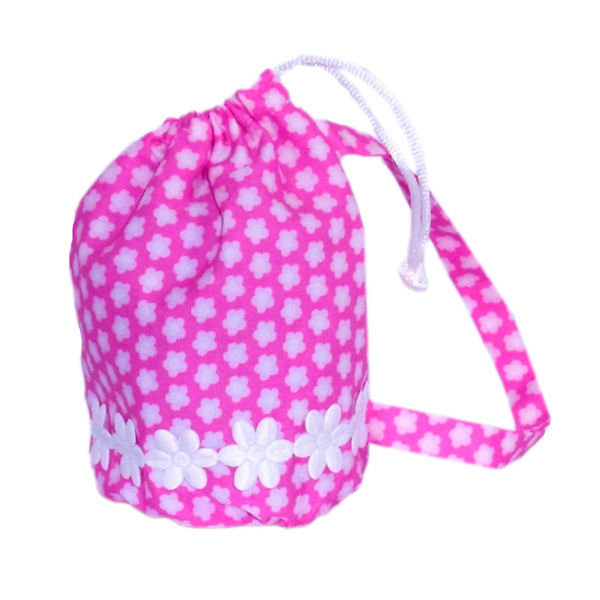 It is just the thing for your doll to take to the beach, the Mall or when visiting friends! Make it ‘yours’ by adding rick rack trim, 1 row of ribbon, 2 rows of ribbon, lace or whatever decoration you like – or have no decoration at all! Make it up in denim, bold colored cottons, use soft pastel shades, the variations are endless. This doll clothes pattern is easy to make and you can use your fabric scraps, so why not make up 5 or 6 bags in different colors with various trims so you have a bag to match with all your outfits! This Beach Bag Pattern is suitable for your American Girl, Australian Girl doll and other 18 inch dolls, as well as many of the Cabbage Patch dolls. In fact it is just the right size for most dolls from 12 – 20 inches (30 – 50cm). When you purchase this downloadable PDF pattern and written instructions, I also give you LIFETIME access to a video tutorial streamed via my website where I show you step-by-step how to make this Beach Bag doll clothes pattern. Enjoy sewing my Beach Bag pattern and I would love you to send me photos or videos of your creations and I will share them on my blog.